To give you a bit of insight into the process of a stair being created I thought I might share a post by an American architect, Bob Borson. Bob is not a particularly famous architect but he does nice work and has a fantastic blog called "Life of an Architect" which you may like to follow as it is informative and more often than not, quite funny. 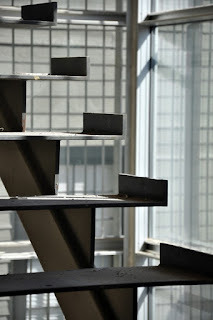 Here is an excerpt from the post "Modern Stairs"
"..the stairs look very simple, at least they look simple to me – and that was the point. Despite all the complicated codes and regulations associated with stairs, despite all the moving parts that went into creating this stairwell, when you look a the finished product, you don’t see any of that." When you are creating your stairs think about what makes your stair significant and distinctive either at the macro level (zoomed out. ie. the shape or path of the whole stair), the micro level (zoomed in. ie. how the stair treads fit together), or both. Remember you are creating a pair of stairs for two developed sections, and should have two sketched sections/details for each stair. So a total of at least 8 sections/details (representing 4 stairs).